When Mountain Goat launched in 1997, their first beer – Hightail – was pretty radical for its days: a hoppy, malty amber ale. But there was discussion at the time that they should go a step further and kick things off with this beer instead, the Surefoot Stout, to really set the cat among the pigeons. Today, it's one of only two beers that survived the brewery's change in direction a few years ago that saw the Pale and Organic IPA discontinued and Steam Ale arrive. And it's one that has been coming out at winter in small batches. 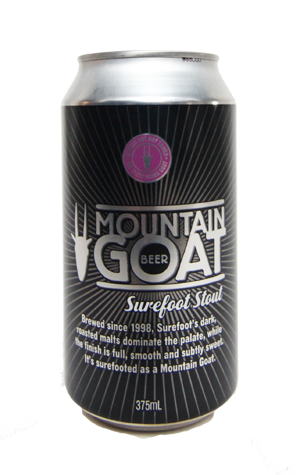 Now it is here in another incarnation: as Goat's third can out of Laverton and, maybe, the first stout to be put inside a tinny by an Aussie brewery. The beer remains the same: a deeply dark brown one with a fluffy light brown head that sits closer to the sweet end of the stout range with roast to a minimum and sweeter, creamier choc nut characters prominent. It's always been one of the most quaffable stouts around and putting it in cans for winter should make quaffing it on your travels easier still.